While I was hosting “Saturday Night Jazz” every weekend on KMHD, I developed a habit of placing a pad of three inch by three inch ruled Post-it Notes in the bag that I used to carry my personal CD’s to and from the station. Whenever I would play a song from one of my CD’s, I would stick a Note inside the jewel case and jot down the date and the track number that I played. I did that to keep track (no pun intended) of which songs I’d played so I would not fall into the rut of playing my favorites over and over and over. Every once in a while as I go through my music collection now, looking for something to write about here, I run across an excellent album that is outstanding in so many ways… Yet when I check my Post-It Note to see how often I played the album, there are only one or two entries. I can only shake my head in wonderment that I was so silly back then as to not recognize the genius that had presented itself to me through that music. That, as I’m sure you’ve already figured out, is the situation with the album I want to tell you about this week. Richie Cole’s father owned a jazz club in New Jersey, which is probably why he took up the alto sax at the tender age of 10. His first professional gig came when he was 18, when he began playing with the Buddy Rich Big Band. On a side note, he is also a victim of our “modern” calendar, a Leap Year baby, having been born on February 29, 1948 in Trenton, New Jersey. Over the years, he performed with some of the biggest names in music: Lionel Hampton, Hank Crawford, Johnny Griffin, Doc Severinson, Phil Woods, The Manhattan Transfer, Sonny Rollins, Boots Randolph, Red Rodney, Freddie Hubbard, Sunny Stitt, and others. His Alto Madness was essentially the idea that any tune, no matter how unlikely its source, could be turned into exuberant bop. With “Back On Top,” Cole presents us with 10 songs, all from his fertile, productive mind. This is important to remember because most of the titles are very common and, frankly, have been used quite a number of times by various composers. Which is not to say that Cole is a derivative writer. Far from it. The most popular themes in song and literature tend to, because of their popularity, come up time and time again. “A Walk In The Park” follows. After a very short teaser at the beginning of the song, we finally get to hear a little from Riabov’s guitar. It’s too soon over, however, and then we find ourselves back to the horns. “A Walk In The Park” is not a barn-burner, but it also is not the sedate, leisurely ballad that the title might lead you to expect. The guys move it along nicely and it will more than hold your interest. The next song we hear is “Uncle Freddy,” presumably not referring to Freddy Kruger. 😉 Despite that, this is a fun piece of music, partly because we do get to hear another all-too-short snippet from Riabov and his guitar. Cole’s intention for the Alto Madness group was for the horns to give them the sound of a large orchestra. With this song, his strategy works in spades! It would be hard to come up with a title more emotionally evocative than “Home Town.” Everyone who has ever lived had one, and the harsh truth is that a lot of folks either miss theirs terribly or loath it with a rancor that will never end. For those of us who never really left ours (the town I grew up in is just 30 miles away, on the other side of the West hills) and still have at least a few fond memories of growing up there, the song “Home Town” will be a joy to listen to. “Home Town” is another title that puts one in mind of a lazy, slow ballad, but you’ll find no such dawdling here. The song charges ahead at, if not full speed, what the navy calls (in the movies, anyway) “all ahead three quarters.” It’s not quite as frenetic as the Minute Waltz, but it’s hardly a lullaby either. All I can add is, you won’t be disappointed by it. Whatever. Bebop, like beauty, is in the eyes (or ears) of the beholder. Cole and the boys give this a Grade-A effort and the result is a superb song. Even Dunton’s drum solo manages to be energetic without carrying on endlessly. 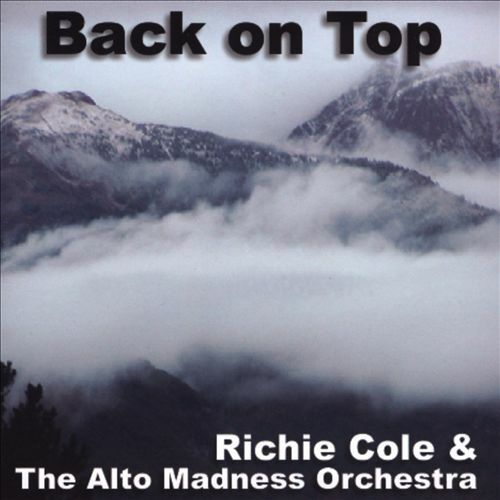 All-in-all, I feel certain that you will find “Back On Top” by Richie Cole and The Alto Madness Orchestra to be a superb addition to your personal playlist, for a Saturday or any other night! You can learn more about Richie Cole and his music by visiting his official web site.